Players continue their competition of PTC3. The Wizard of Wishaw showed his incredible magic at the beginning of the day. 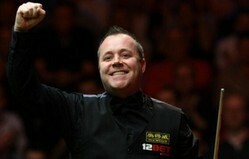 His opponent Mitchell Mann once led 3-0 but Higgins wielded his magic, winning three frames in a row to win 4-3. His later victory over Joe Perry and Jimmy White put him in the Last 16. Gorgeous Graeme Dott was on fire too. He beaten two world champions including Ronnie O'Sullivan and Stephen Maguire to move on to Last 16. O'Sullivan admitted he did not have top performance today on Twitter. 'Not good tonight , missed to many balls, dott was solid though'. Dott's country fellow Marcus Campbell also continue his competition in PTC3. In Total there are six Scots took their seats in the final sixteen (Higgins, Maguire, Dott, Campbell, McGill, McManus) . It is a great news for Scotland's snooker. PTC2 Winner and Birthday Boy Judd Trump lost to Xiao Guodong from China 0-4 in the Last 32. The Chinese continued his record in the PTC events, reaching at least Last 16 in past events. Mark Selby, Matthew Selt, Barry Hawkins and Jamie Jones are the other players who stays in the competition until the final day.